Viking Chieftain All-Natural Drinking Horn with Hammered Brass Trim | BUDK.com - Knives & Swords At The Lowest Prices! Glasses - meh. Don’t drink like a pansy! Gulp down ale from this rustic All-Natural Drinking Horn, just like your tough, mead-quaffing Viking ancestors. In typical soirées full of imbibers grasping boring, tired old red plastic Solo cups filled with straw-colored American lager, you’re sure to become the life of the party glugging rich dark brown ale from this drinking horn, fit for a real man’s man of a weekend warrior. Real cow horn, this distinctive, exquisitely unsophisticated drinking vessel is beautifully polished to a high shine to accent the pure shades of white and cream, streaks of black and brown, and countless other hues and highlights that may be found deep-rooted in the handsome natural grain. Colors will vary from piece to piece. 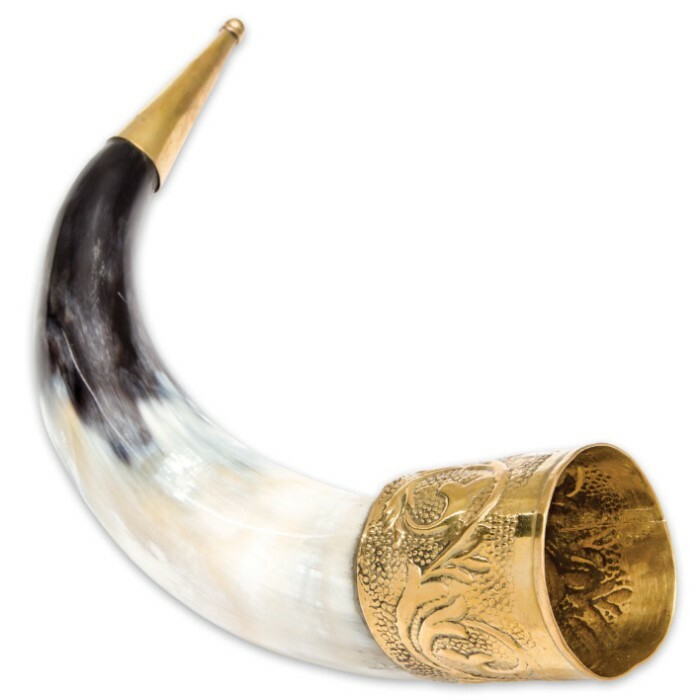 The horn is offset with elegant vintage brass trim, characteristic of horns reserved for chieftains and Vikings of high status in Iron Age Scandinavia. The antique brass looks like it was forged by real Vikings with its vine-and-dimples pattern, featured in fine hammered relief. 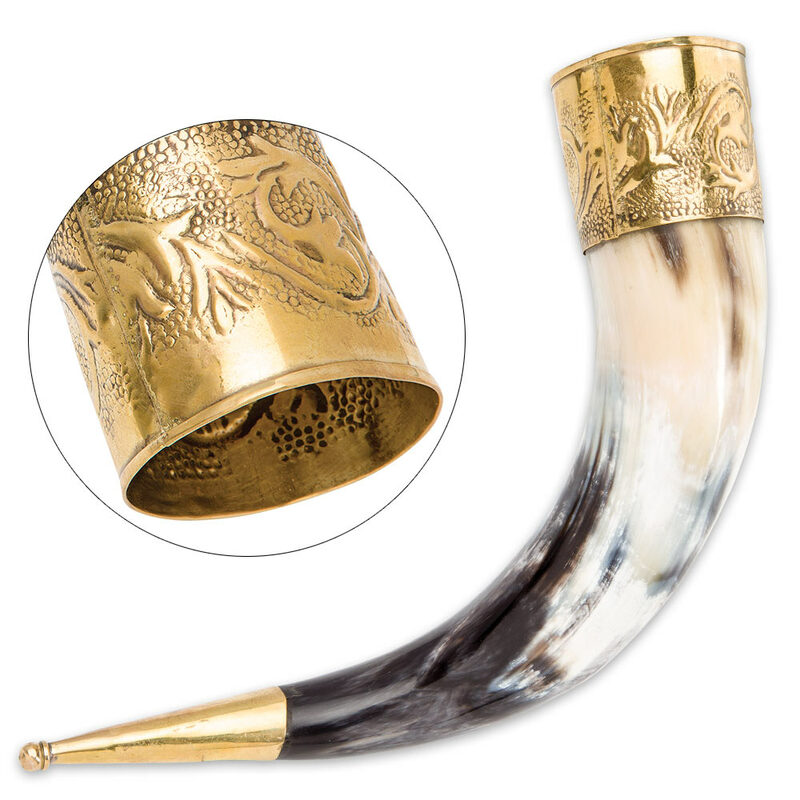 The Viking Chieftain Natural Drinking Horn with Brass Trim gracefully showcases your proud Viking roots. It’s also a great prop for theater, screenplays, reenactments, cosplay and makes a terrific gift for individuals of Scandinavian descent, history buffs, Iron Age scholars and anyone who likes to drink and look cool doing it! Measures 15” long.